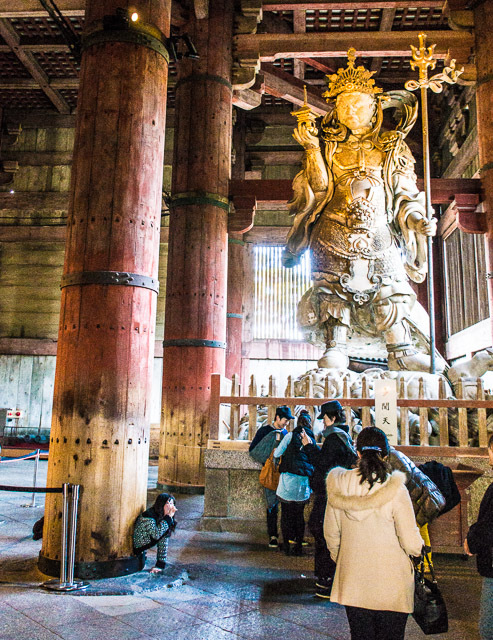 Moe and I took a side trip to Nara by train, about one hour away. At the Information Center we had a wonderful chat with a "Trainee". He was learning how to guide tours, but was proficient in English, having lived in Baltimore, MD, a few years back. 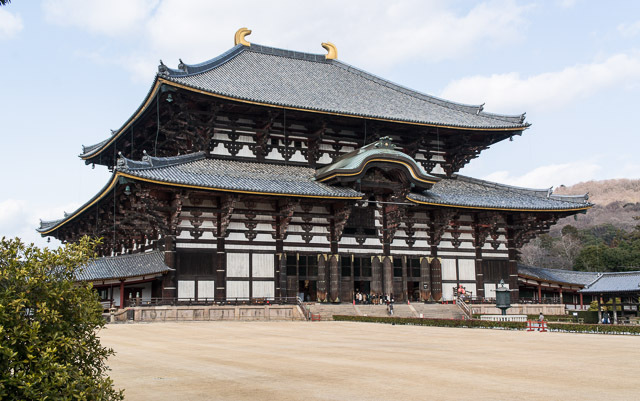 He guided us to Nara's main attraction, the huge temple complex of Tõdai-Ji. 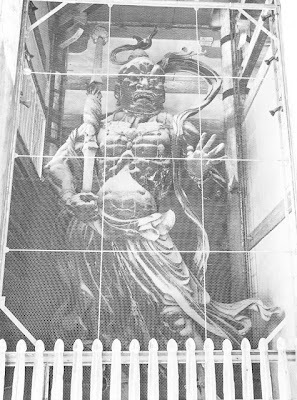 On the way to the temple, you pass through the Nandai-mon gate which is guarded by two fierce, huge Niō guardians. They are wooden carvings from the 13th century, recently restored and behind wire. 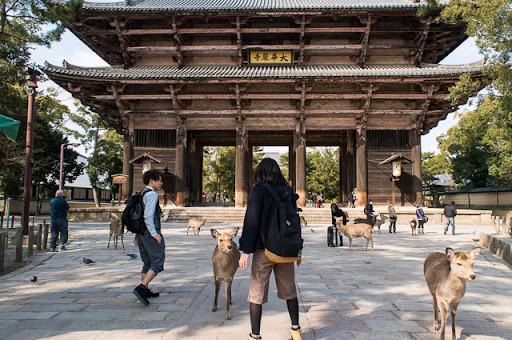 Guardians of a different kind are the Nara deer (size of white-tailed deer), challenging every visitor. They want the food in your hand or backpack and the paper in your pocket! Moe was accosted by a paper-eating one. 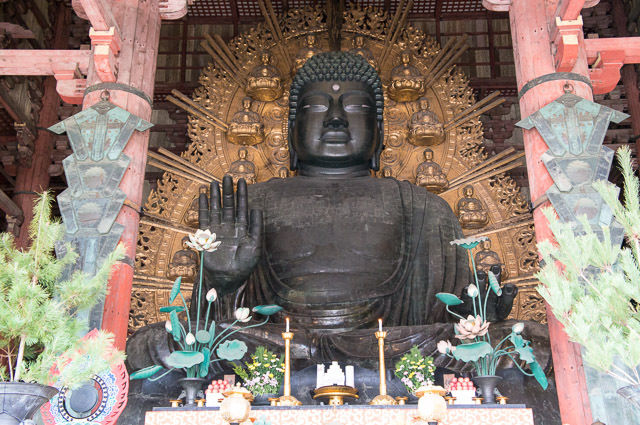 The temple Daibutsu-den could be the largest wooden structure in the world. 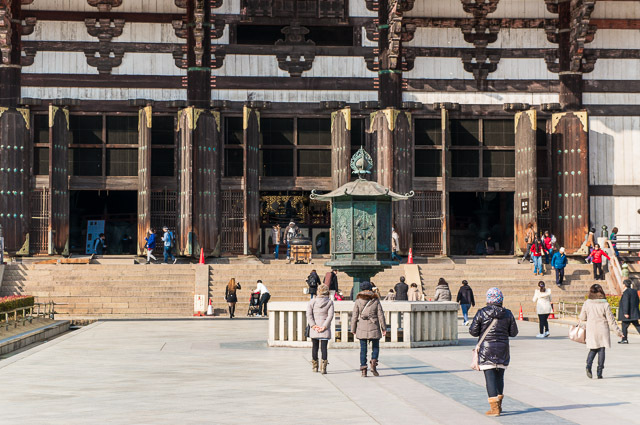 It is hard to show the immensity of this building. 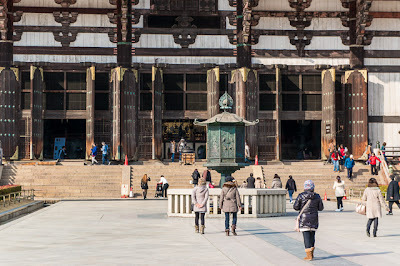 The little white dots on the steps leading up to the door are people! 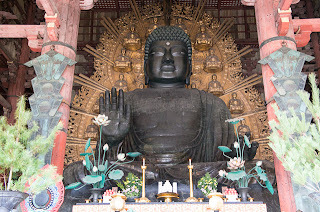 Inside is the great Buddha. 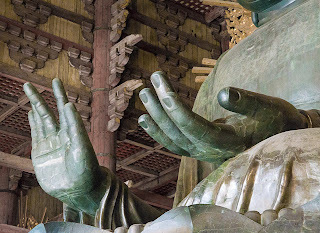 The bronze figure is 50 feet tall and has 437 tons of bronze. Legend has it that if you can slip thru the hole in the base of the column (the size of the opening in Buddha's nostril) next to the statue of Tamon-ten, you are assured of enlightenment. Watching adults (bottom left) try to squeeze thru caused a lot of laughter; Tamon-ten looks down like he's seen it all before.